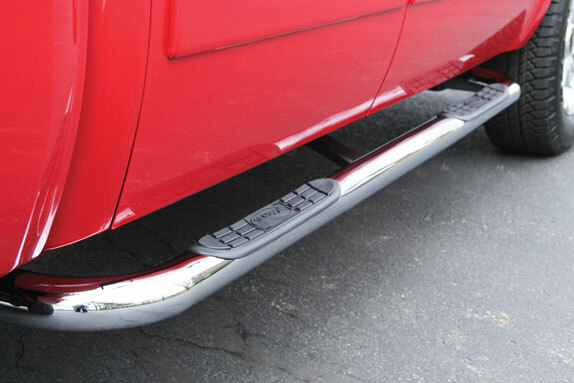 Trail FX - 3” Stainless Steel Side Bars are made of T304 marine-grade stainless steel tubing. Includes ABS injection-molded plastic step plates and powder-coated vehicle-specific mounting brackets for ease of installation. Available for most popular Trucks, SUVs, and CUVs. Styles include Stainless Steel and Black Powder-Coated Steel. 3" Stainless Steel Side Bars are made of T304 marine-grade stainless steel tubing. Includes ABS injection-molded plastic step plates and powder-coated vehicle-specific mounting brackets for ease of installation. Available for most popular Trucks, SUVs, and CUVs. Styles include Stainless Steel and Black Powder-Coated Steel.